A little while back we posted an article that featured some great cooking ideas using Jason Winters Green Tea. There are tons of clever ways people use green tea, and we’re always looking for new ways you can include your favorite blend in a dish or drink. Well, summer is just about here, so we wanted to share more recipes that you can include some green tea in. Enjoy! When we first posted our Sir Jason Winters green tea recipes, Sir Raymond Winters had recently finished a PR trip to Japan. During that trip, prominent Japanese chefs made some beautiful – and delicious – looking dishes. One Japanese dish that embraces the flavor of green tea is Ochazuke, which is essentially green tea poured over rice. To make Ochazuke, you’ll need Japanese rice crackers, steamed rice, seaweed, wasabi (if you’re bold enough), and, of course, green tea. This dish can be created a number of ways, so there’s no exact measurement you need to follow. Just be sure to start with a bowl of rice and add enough green tea to submerge all the rice. From there, place smashed Japanese rice crackers, seaweed flakes and whatever else you want into the dish. 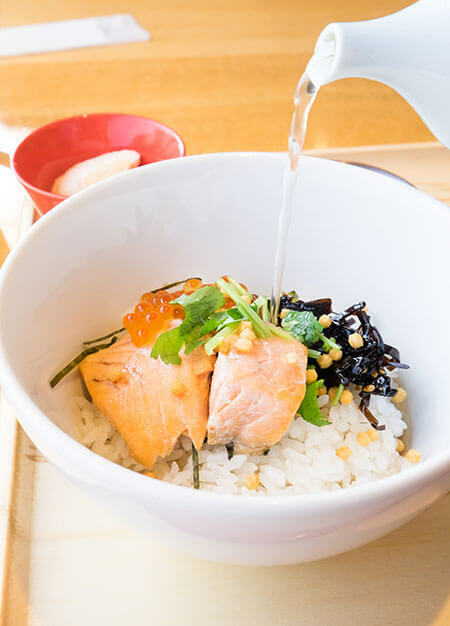 If you want to add fish, Ochazuke also goes incredibly well with salmon. Broil the salmon until golden brown. After, remove the skin and put it in your bowl with the other ingredients. The perfect summer snack! To prepare this dish you will need to use an ice cream maker. Start by mixing the Green Herbal Tea powder with the milk. Then add the heavy cream with the green tea mix while cooking in a pot on low heat. Stir it for 5-7 minutes, until the entire mixture is heated. Strain out the green tea leaves if desired. After, mix the sugar and eggs in a bowl. Gradually add your green tea mix to the bowl, making sure to mix everything together before adding more mix. Put all of this back into the pot and cook it over low heat for 5 minutes or so, stirring it and making sure everything is mixed. Remove it from the heat, let it cool to room temperature then put it in the refrigerator for 4 hours or more. After it’s cool, run it through your ice cream maker. 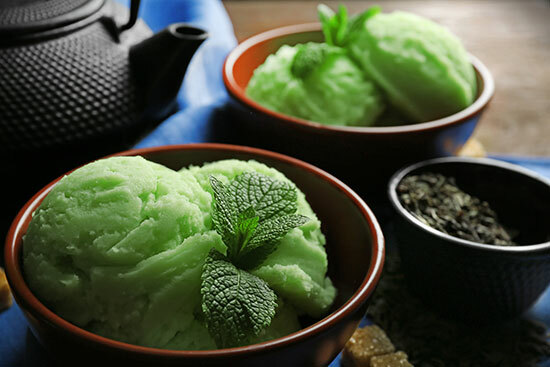 And there you have it – delicious Sir Jason Winters Green Tea Ice Cream! 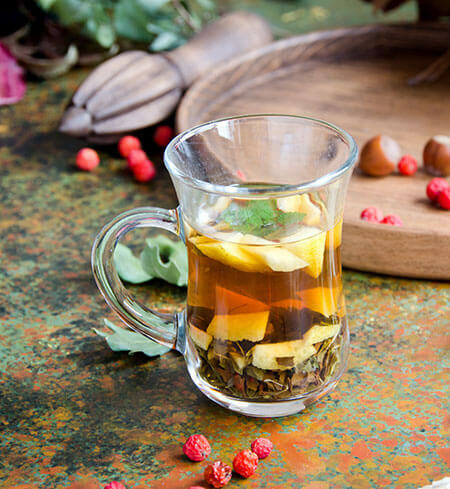 If you’re living in an area that gets pretty hot in the summer, then you’ll probably want to switch away from the classic hot water steeping you often use to prepare tea. Most iced teas you find use black tea, but there are plenty of great iced green tea recipes you can follow! Here is one of our favorites. Prepare green tea how you normally would (steeping it in hot water). While the water is still hot, also add some honey, agave or something similar that you normally mix with your tea. Put the tea in your refrigerator to cool off, and be sure to add some ice. Once it’s cold, add mint leaves to the drink. Mix it up, pour it over more ice and enjoy! Another green tea drink we’re enjoying right now is a mango-green tea hybrid drink, perfect for while you’re sitting outside on a sunny day. Just make the iced tea the same way as described above, but don’t include any honey or another additive. The mango juice should make this sweet enough as is! If you have any favorite green tea recipes for the summer that didn’t make this list, feel free to share this post and add your recipe on social media! So Which Sir Jason Winters Product Is Perfect For You? Should You Drink Green Tea While Pregnant?